Taxiing is the controlled movement of the airplane under its own power while on the surface. Since an airplane is moved under its own power between a parking area and the runway, the pilot must thoroughly understand and be proficient in taxi procedures. An essential requirement in conducting safe taxi operations is where the pilot maintains situational awareness of the ramp, parking areas, taxiways, runway environment, and the persons, equipment and aircraft at all times. Without such awareness, safety may be compromised. Depending on the airport, parking, ramp, and taxiways may or may not be controlled. As such, it is important that the pilot completely understand the environment in which they are operating. At small, rural airports these areas may be desolate with few aircraft which limits the potential hazards; however, as the complexity of the airport increases so does the potential for hazards. Regardless of the complexity, some generally accepted procedures are appropriate. The pilot must be vigilant of the entire area around the airplane to ensure that the airplane clears all obstructions. If, at any time, there is doubt about a safe clearance from an object, the pilot should stop the airplane and check the clearance. It may be necessary to have the airplane towed or physically moved by a ground crew. When taxiing, the pilot’s eyes should be looking outside the airplane scanning from side to side while looking both near and far to assess routing and potential conflicts. A safe taxiing speed must be maintained. The primary requirements for safe taxiing are positive control, the ability to recognize any potential hazards in time to avoid them, and the ability to stop or turn where and when desired, without undue reliance on the brakes. Pilots should proceed at a cautious speed on congested or busy ramps. Normally, the speed should be at the rate where movement of the airplane is dependent on the throttle. That is, slow enough so when the throttle is closed, the airplane can be stopped promptly. The pilot should accurately place the aircraft centered on the taxiway at all times. Some taxiways have above ground taxi lights and signage that could impact the airplane or propellers if the pilot does not exercise accurate control. 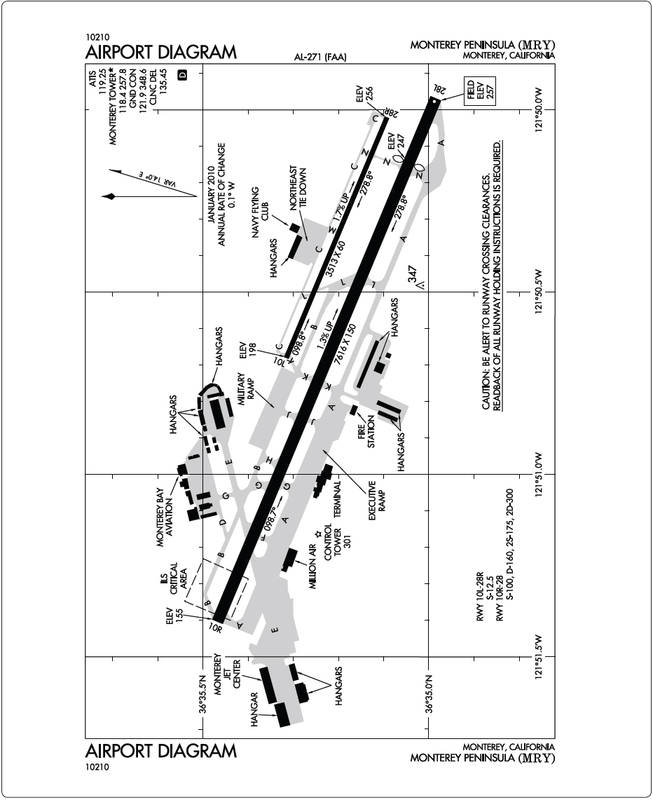 When yellow taxiway centerline stripes are marked, this is more easily accomplished by the pilot visually placing the centerline stripe so it is under the center of the airplane fuselage. When taxiing, the pilot must slow down before attempting a turn. Sharp high-speed turns place undesirable side loads on the landing gear and may result in tire damage or an uncontrollable swerve or a ground loop. Swerves are most likely to occur when turning from a downwind heading toward an upwind heading. In moderate to high-wind conditions, the airplane may weathervane increasing the swerving tendency. Steering is accomplished with rudder pedals and brakes. To turn the airplane on the ground, the pilot should apply the rudder in the desired direction of turn and use the appropriate power or brake to control the taxi speed. The rudder pedal should be held in the direction of the turn until just short of the point where the turn is to be stopped. Rudder pressure is then released or opposite pressure is applied as needed. More engine power may be required to start the airplane moving forward, or to start a turn, than is required to keep it moving in any given direction. When using additional power, the throttle should immediately be retarded once the airplane begins moving to prevent excessive acceleration. The brakes should be tested for proper operation as soon as the airplane is put in motion. Applying power to start the airplane moving forward slowly, then retarding the throttle and simultaneously applying just enough pressure to one side, then the other to confirm proper function and reaction of both brakes. This is best if the airplane has individual left/ right brakes to stop the airplane. If braking performance is unsatisfactory, the engine should be shut down immediately. Figure 2-14. Control positions of the nosewheel airplane. 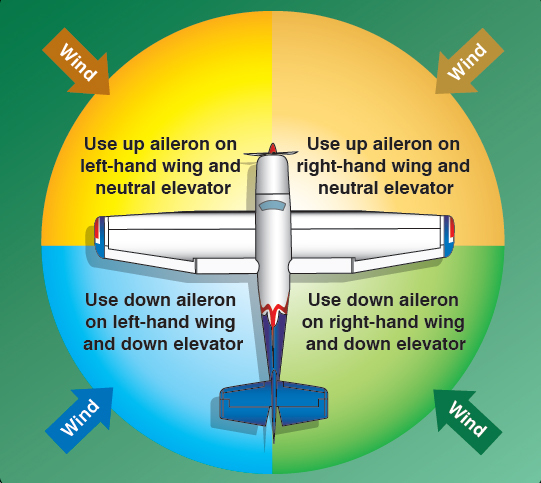 The presence of moderate to strong headwinds and/or a strong propeller slipstream makes the use of the elevator necessary to maintain control of the pitch attitude while taxiing. This becomes apparent when considering the lifting action that may be created on the horizontal tail surfaces by either of those two factors. The elevator control in nosewheel-type airplanes should be held in the neutral position, while in tailwheel-type airplanes, it should be held in the full aft position to hold the tail down. Downwind taxiing usually requires less engine power after the initial ground roll is begun, since the wind is pushing the airplane forward. To avoid overheating the brakes and controlling the airplane’s speed when taxiing downwind, the pilot must keep engine power to a minimum. Rather than continuously riding the brakes to control speed, it is appropriate to apply brakes only occasionally. Other than sharp turns at low speed, the throttle should always be at idle before the brakes are applied. It is a common error to taxi with a power setting that requires controlling taxi speed with the brakes. When taxiing with a quartering tailwind, the elevator should be held in the DOWN position, and the upwind aileron, DOWN. Since the wind is striking the airplane from behind, these control positions reduce the tendency of the wind to get under the tail and the wing and to nose the airplane over. The application of these crosswind taxi corrections helps to minimize the weathervaning tendency and ultimately results in making the airplane easier to steer. During crosswind taxiing, even the nosewheel-type airplane has some tendency to weathervane. However, the weathervaning tendency is less than in tailwheel-type airplanes because the main wheels are located behind the airplane’s center of gravity, and the nosewheel’s ground friction helps to resist the tendency. The nosewheel linkage from the rudder pedals provides adequate steering control for safe and efficient ground handling, and normally, only rudder pressure is necessary to correct for a crosswind. Taxiing checklists are sometimes specified by the AFM/POH, and the pilot must accomplish any items that are required. If there are no specific checklist items, taxiing still provides an opportunity to verify the operation and cross-check of the flight instruments. In general, the flight instruments should indicate properly with the airspeed at or near zero (depending on taxi speed, wind speed and direction, and lower limit sensitivity); the attitude indictor should indicate pitch and roll level (depending on airplane attitude) with no flags; the altimeter should indicate the proper elevation within prescribed limits; the turn indictor should show the correct direction of turn with the ball movement toward the outside of the turn with no flags; the directional gyro should be set and crossed checked to the magnetic compass and verified accurate to the direction of taxi; and the vertical speed indictor (VSI) should read zero. These checks can be accomplished on conventional mechanical instrumented aircraft or glass cockpits.